$4.99 Standard Flat Rate Shipping. They take you on adventures, keep you balanced, and move you forward. Isn’t it time to give your feet a break? At FootSmart, you can treat your feet to both style and comfort with a wide selection shoes, socks, slippers, and pain relief products. Take the pain out of spending by using a FootSmart coupon code and run off with the savings. 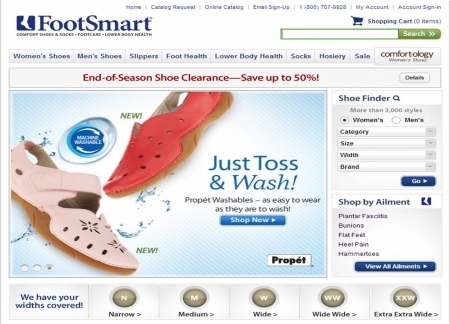 FootSmart has a wide variety of shoes, socks, slippers, and foot pain relief products. Cherish your feet and buy them a treat! Use a FootSmart coupon code to save money on each purchase. Below are instructions on how to use and apply a FootSmart coupon code. 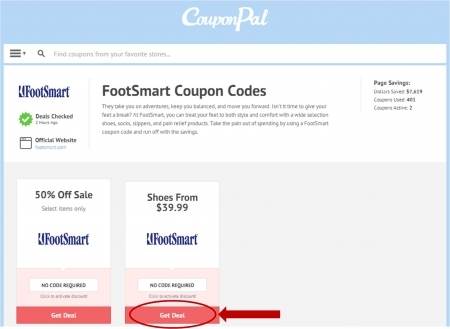 After locating the coupon or deal you want to use to purchase FootSmart items, click the corresponding "Get Deal" button on the Couponpal Website. A new window will pop open when you click on your button. If Couponpal is providing you with a FootSmart coupon code, copy and paste from the pop up window. Keep this window open in case you need to come back to it later. If there is no FootSmart coupon code, you will skip this step. "Get Deal" may indicate there is no FootSmart coupon code and your promotion will automatically be applied when you click this link. 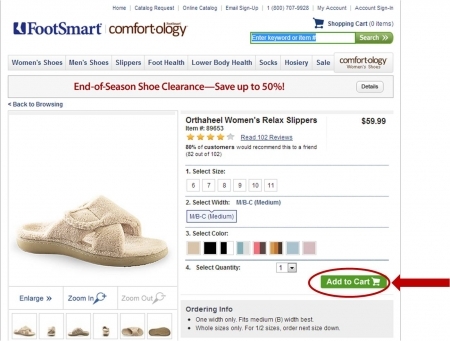 After you have clicked the Couponpal "Get Deal" button, your window will be redirected to footsmart.com. Use the Shoe Finder to filter through the available shoes. Select Women's or Men's, the category of shoe you are looking for, size, width and / or brand. Then click "Go." 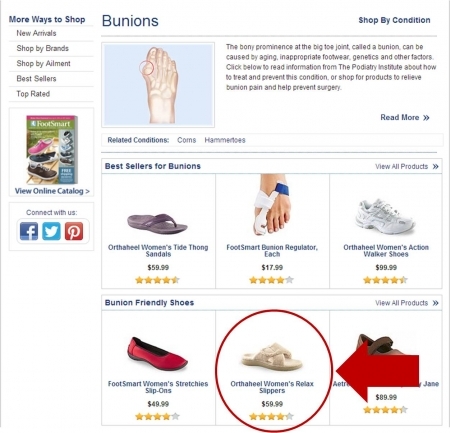 You can also shop by Ailment, such as Planter Fasciitis, Bunions, Flat Feet, Heel Pain, or Hammertoes. If you have a different ailment, click "View All Ailments." When you find a shoe you are interested in, click on it's picture to take you to the product page. Select options such as size, width, color and quantity. Then click "Add to Cart." 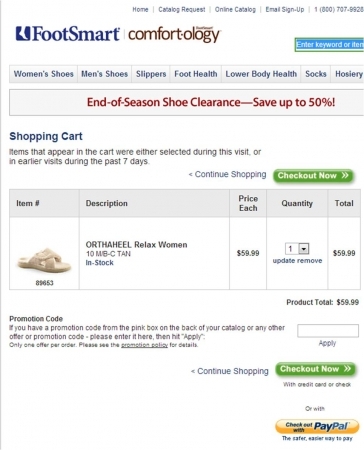 Confirm everything in your cart is correct. If you have a FootSmart coupon code or promotion code, enter it into the box, then click "Apply." Next, click "Checkout" or "Pay with PayPal." If you have a FootSmart Account, enter your email address and password. Then click "Sign-In." If you do not have a FootSmart account, click "Continue Checkout." Fill in shipping & billing information. Review your order, then receive order confirmation. We all know the aches and pains of a long day – sore feet, aching back, tired legs. Did you know a good pair of shoes can change all of that? Put your feet on a good foundation with shoes from FootSmart.com that are designed with your body in mind. Whether you spend all day on your feet at work, go for long walks, or just want to treat your feet, you’ll find the right shoes at FootSmart. It’s easy to find great looking shoes that will leave your feet feeling terrible, but not at FootSmart. Here you’ll find fashionable styles from brands like Easy Spirit, Clarks, Brooks, Aerosoles, Crocs, Naturalizer, Orthaheel, and many more, that are as comfortable as they are stylish. Whether you need a sturdy pair of shoes to keep you on your feet at work, or some nice slip-ons to wear around the house, you’ll find supportive styles for all occasions. They even carry supportive sandals, so you won’t have to compromise on comfort even in the summer. For the athletes out there, cross the finish line with brands like Asics, Brooks, and New Balance in the FootSmart Running Store. Besides shopping a wide variety of brands and styles, at FootSmart.com you can also search for footwear for specific lower-body health concerns. Have back pain? Leg pain? Trouble with your knees? Take a look in the Lower Body Health store and you’ll discover shoes made to correct your specific health concern. Keep your feet happy with insoles, orthotics, arch supports, and other foot health products that are also available. Since being founded in 1989 in Georgia, FootSmart has been dedicated to providing solutions to lower body pains and health problems with smart footwear. The company has partnered up with healthcare professionals in order to be able to offer the best footwear and lower body health products on the net. Today, FootSmart has expanded to offer comfort shoes for both men and women, as well as a wide variety of foot care products, and even online quizzes to help customers find the ideal fit. You never know where your day is going to take you, but there’s one thing you can be sure of: Your feet will take you every step of the way. Treat your feet like the good friends they are with supportive styles from FootSmart. Don’t forget to use a FootSmart coupon code to get a foot in the door of savings. It’s time to give your feet some TLC. At FootSmart, you can find comfortable shoes that are perfect for people with bunions, heel pain, or sensitive feet. If you need shoes that will give your feet some extra support, FootSmart is the place for you. Here are some questions you might come up with while browsing the site. Why isn’t my FootSmart coupon code working? You’re getting ready to check out with some brand-new shoes in your shopping cart, when you realize your coupon code doesn’t seem to be working. If this happens, check to see if the coupon codes have any special restrictions attached to them. Things like expiration dates or minimum size orders can prevent discounts from being applied. To reach a FootSmart customer service representative, you can call 1-800-707-9928, Monday through Thursday, from 8 a.m. to 11 p.m., Friday through Saturday from 8 a.m. to 10 p.m., or Sunday from 9 a.m. to 10 p.m. (all times EST.) If you’d like to email them, fill out the form on the Contact Us page. FootSmart wants it to be super easy for you to return products you’re unhappy with, so they allow items to be returned within 60 days for a full refund. Please note that the refund does not include shipping and order processing fees. All returned items must be unused and in resalable condition. For additional details, visit the Returns and Exchanges page. Unless you received a coupon code that offers discounted shipping, you are responsible for shipping costs. However, you should check to make sure that FootSmart isn’t offering any promotions on shipping before you check out. For estimated shipping costs, go to the Shipping page. What payment methods are accepted at FootSmart? If you’d like to keep track of your current order, you can go to the Track Order Status page. From here, you can enter your zip code and order number to see what stage your purchase is in.